Designed in two separate modules, one for sleeping and one for entertaining, the Pavilion 140 brings a new dimension to the weekend getaway As displayed, the two modules form a rough L shape, but this can be reconfigured to suit the size and style of individual blocks. "It is quite a different type of design," Helen Lowrie of Sarah Homes says. "It doesn't appeal to everyone but it has sold well since we introduced it in December. People who like a more architectural focus in a home and are looking for something quite contemporary are extremely happy with what the home has to offer." Expansive decking around the modules provides a great place to entertain in the warmer months and easily accommodates large groups of people. 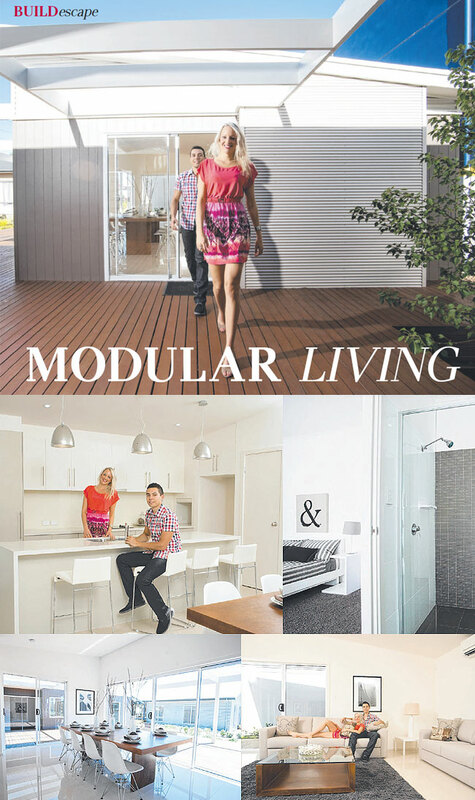 The sleeping module contains all four bedrooms, including the main with a sliding door to a private outdoor area, large built-in wardrobe spanning the length of one wall and en suite, including oversized shower. The three minor bedrooms are all placed closely together, ideal for keeping an eye on holidaying children who should be sleeping after a full day of entertainment. A three-way bathroom ensures quick turnarounds in the morning. Opposite is the good-sized laundry, which includes a work bench, underbench cupboards and outdoor access. A short walk across the decking leads to the living module. This includes a kitchen with acrylic benchtop, breakfast bar, overhead cupboards, white tiled splashback, refrigerator nook and a goodsized walk-in pantry. Porcelain tiles in the living area provide a hard-wearing option, while the gloss finish and rectified edges add to the feeling of space. Large windows and three sets of glass doors ensure natural light is always flooding into this living space, creating a light and bright atmosphere all year round as well as providing excellent ventilation. "While adults entertain in the living area they won't disturb sleeping children," Helen says. "And if kids want to get up early they can go into the other module and mum and dad can enjoy a sleep-in. "Another advantage with this type of home is that people can add modules at later dates. "Once the children have grown into teenagers, adding a second living module for them to entertain themselves is an excellent option. "The extra modules are custom designed to suit individual requirements and the original modules are quite flexible so people can add or subtract elements."